يشكل فندق Snooze Inn بموقعه الممتاز في قلب فرتتدي فالي نقطة انطلاق ممتازة لاستكشاف بريسبان. إن موقعه الجيد الذي يبعد 2.4 Km فقط عن مركز المدينة يساعد النزلاء على الاستمتاع بمعالم المدينة ونشاطاتها. يشكل هذا الفندق ملاذاَ مريحاً للاسترخاء ويمنح زواره فرصة للاستجمام والتجدد، وهو يقع على بعد خطوات من المعالم السياحية الكثيرة للمدينة كمثل: Valley Metro Shopping Center, Jugglers Art Space Inc, Fortitude Valley. يقدم Snooze Inn خدمات لا غبار عليها وكل أشكال اللياقة وحسن الضيافة اللازمة لإسعاد ضيوفه. تتضمن الميزات الرئيسية في هذا الفندق: واي فاي مجاني في جميع الغرف, خدمة سيارات الأجرة, تسجيل وصول/خروج سريع, تخزين الأمتعة, واي فاي في المناطق العامة. تعكس غرف الفندق البالغ عددها 26 المنتشرة في 2 طوابق جواً من الدفء والألفة.خدمات عصرية مثل تلفزيون بشاشة مسطحة, بياضات, اتصال لاسلكي بالإنترنت, اتصال لاسلكي بشبكة الإنترنت (مجاني), غرف لغير المدخنين موجودة في بعض الغرف المختارة. كما أن مجموعة الخدمات الواسعة الموجودة في الفندق لضمان راحتك تترك لك الكثير من الخيارات لقضاء وقتك أثناء فترة إقامتك. إن كنت تتطلع إلى إقامة مريحة وهادئة في بريسبان، فستجد في Snooze Inn بيتك الثاني. مكتب الاستقبال مفتوح من الساعة 8 صباحًا إلى 6 مساءً من الاثنين إلى الخميس، ومن 8 صباحًا إلى 7 مساءً أيام الجمعة والسبت ومن 8:30 إلى 6 مساءً أيام الأحد. يجب على النزلاء الذين سيصلون في وقتٍ آخر -غير الأوقات المذكورة أن يتصلوا بالعقار مباشرةً قبيل وصولهم؛ وذلك حتى يمكن إجراء ترتيبات أخرى. يُرجى إطلاع العقار على الموعد التقريبي لوصولك في خانة "طلبات خاصة" عند الحجز. يوجد موقف سيارات آمن خارج الفندق في مترو فالي كار بارك الذي يقع في شارع ألفريد (على بعد حوالي 200 متر من العقار) مقابل رسوم إضافية 18 دولار أسترالي في اليوم. يمكن شراء تذكرة موقف السيارات مسبقًا من استقبال سنوز إن (للنزلاء فقط). التذكرة صالحة للدخول مرة واحدة والخروج مرة واحدة فقط في اليوم. we had to catch flight early morning, parking was bit of issue as we were there about 6PM, there is free street parking overnight but just few spots, bit tiny bathroom, but was value for money. room was clean and had pretty much all you need. The Snooze Inn is by my practice in a dicey part of town for a woman traveling solo, yet I booked it for its location and it worked out very well. From there I walked to sight see all I wanted—many hours in this beautiful city—and returned to safely lock myself in for good sleep before catching public transport to the airport. The staff was good to their word. I never used the WiFi. Decent shower. I stayed for a night. This is just a normal Lodge. Do not expect anything great. The rooms are decent. I had dost accumulated on the side of my bed. I also so consumed noodles underneath my bed. More care should be taken on housekeeping. Don't expect anything great. This is just a normal Lodge. Great value for the location and was clean and tidy. Property is a little 'tired' looking, however the biggest drawback is the amount of nearby construction which resulted in jackhammering from 6am each day. Not obviously the property's fault, it's just the location - depends on your needs. excellent service. highly recommended to everyone. will definitely stay there again. staff very professional and helpful. room clean and cozy. good location, close to public transport. enjoyed my stay there very much. Very basic but cozy. Warm aircon in winter. Comfortable bed and pillows. Tea/coffee and milk etc. provided. Quiet location. I cannot comment on the kitchen as I did not visit it. Facilities were clean. A coat of fresh paint is probably on the agenda. Easy check in and check out. Nice people delivering a a fully serviced budget situation. Excellent monetary value on what is essentially an inner city position. Five minutes walk to the Fortitude Valley train station platform, and the next station after that is Central. Eateries of all sorts in very close proximity, with Chinatown a 7 minute walk away, if you want to walk past any number of them to get there. A very well equipped kitchenette if you want to prepare your own. Laundry on the premises. It’s a hidden treasure & was definitely worth the money but only through Agoda. Agoda have been quite professional toward me & very friendly. I will only ever have to use Agoda from now on with my travels & hotel bookings. Checked into hotel and was greeted by the smell of mold in the room. I went to ask to be moved, only to be told that it is a cheap room so what did i expect? We moved to another room (he miraculously found one after telling me the hotel was fully booked) which smelled better, but the shower head squirted water across the bathroom and drenched the toilet and all the toilet paper etc.. After a brief interaction with the manager and feeling accused of sabotaging the shower, he gave me the keys to ANOTHER room to shower in. Unreal. Everything was filthy, mold in all the grouting, carpet not vaccumed and air con unit dripping water all over the top of the bed. 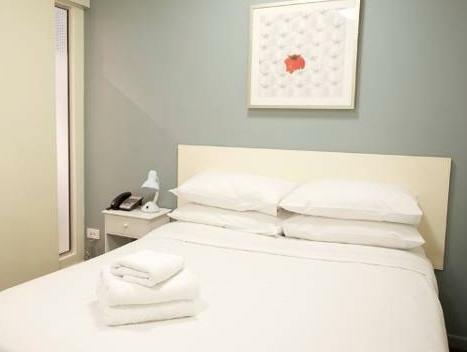 It might be a cheap hotel, but for $60 a night there are much better choices. Pro's: Super cheap and in a great location only a 10min walk to showgrounds and 200m from the train station. Easy and fast check in. Room was smallish but had cold aircon, tv, mini fridge, desk, chair, kettle, ensuite and clean white sheets on bed. Con's: No free parking included or close by. Noise and vibrations from music/band playing at pub close by can be heard til early hrs of morning and people walking down hallway as well but was super tired so neither really kept me up. No windows except one over toilet with view of brick wall. Not really any other facilities other than smoking area on outside back stairway. Overall though was worth what i paid and would stay again for another one night stay to go to a concert at the showgrounds. We were told that there was free parking when we booked the room. But we could only park our car on street when we arrived there. We called the hotel service (as the reception was closed on Sunday) and she told us there was nothing she could do because a voucher was needed for free parking and only reception could give us voucher. I didn’t understand why the hotel didn’t give us voucher while they left the room key to us. At the end we had to leave at 7am next morning to avoid penalty. Bad! Clean and comfortable. Bit noisy. Staff OK. Bit noisy. Clean and comfortable. Good for the price paid. Clean comfortable room. Not very well sound proofed and can hear other guests, doors banging, walking around. Staff efficient and can be a bit friendly. 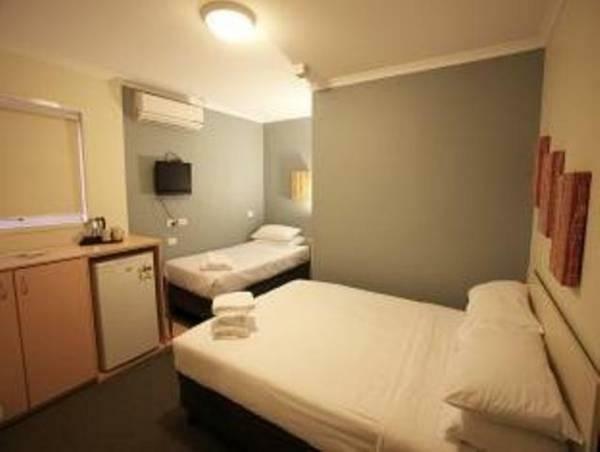 I would book this motel again at the rate I got which was an amazing 48 Aud per night. Considering the location and laid back security, office only open till 6, i would not pay more than 60 per night max. Not the safest area to stay unless your street wise or a regular world traveler. 3 times after the office was closed, the front door with access only by key-card was left open to the whole building because the door would am if not shut properly, a simple repair for security sake. My window had a small lock which could be broken easily. Security needs attention. Other than that, great staff, very helpful. Short term stay fine. Fortitude Valley, unfortunately is looking dodgy as ever. 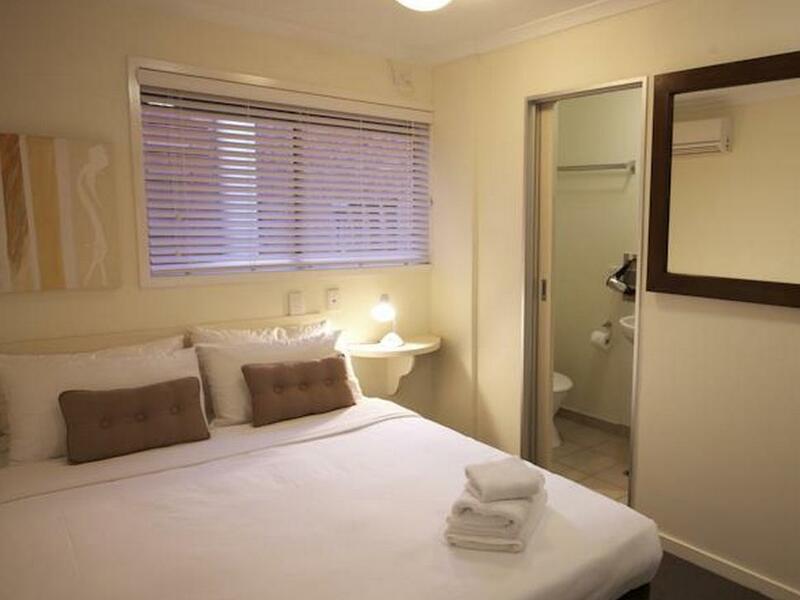 The hotel is a 5 minute walk to Fortitude Valley station. The room was small with no view. But for for $60 can't complain. There's also free Wi-Fi. The staff was very friendly and approachable. Had dinner at the jubilee which is just down the road. Would I stay here again? Yes I definitely would. Wouldn’t stay here again. Couldn’t check in, after hours (605pm!) intercom not working. No one at the property and no way of accessing the after hours key safe. Arrived with a tired hungry baby waiting on the street while we rang all the numbers to be told someone will come in half an hour. Place was loud with people up and down the hall banging doors the entire time. Patched holes in the walls. Hotel that attracts some unsavoury characters. Ive new given a bad review but there is always a 1st. I had a shower and the shower head and connection sprayed water all round the bathroom soaking my clothes for the night, we left at 2am after feeling something crawl over my face a few time, I killed 4 large cockroaches. I rather the drink driving charge than spend the rest of the night. I was a shame because I used to stay there years ago, and itv was a cheap clean establishment, value you for money. Run down and looks nothing like the photos.